For the second time in seven months, President Trump will visit a Boeing factory to hype corporate tax cuts. He’s chosen the wrong poster child. If there was something preventing the aerospace giant from expanding its business before the Trump-GOP tax law, it certainly wasn’t taxes. Boeing made headlines in 2016 only because after years of paying negative, zero or single-digit federal tax rates, its financial filing revealed the company finally paid something comparatively substantial. Over 10 years (2008 to 2017), the company paid an effective federal tax rate of 8.4 percent on $54.7 billion of U.S. profits. Boeing’s latest annual financial report is for 2017, the final year it would be subject to the former 35 percent corporate tax rate. 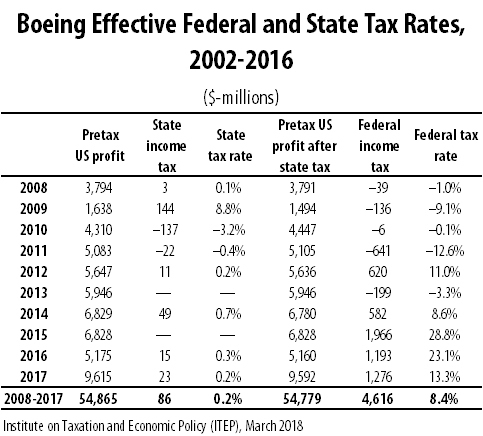 The report shows that Boeing paid an effective federal corporate tax rate of just 13.3 percent that year on $9.6 billion of U.S. income. This means Boeing sheltered more than half of its profits from tax last year. Despite this, President Trump today plans to talk up the benefits of the Tax Cuts and Jobs Act, which slashed the corporate tax rate to 21 percent from 35 percent. The president is likely to repeat the corporation’s claims that the tax cuts have made it possible for Boeing to make new investments in its workers and its productive capacity. It’s hard to square these claims with the fact that over 10 years, the company paid an average effective rate that is less than half the newly low corporate tax rate. Its already low tax rates weren’t enough to keep the company from laying off workers as recently as last year. Nonetheless, Boeing’s leadership is playing along with Trump’s rosy economic claims. In December, the company issued a press release discussing the socially productive uses to which the company would put its new tax cuts. The release promised $300 million of one-time investments in worker training, infrastructure and charitable giving, and it strongly implied that these investments would not have been made absent the tax cuts. To put this in context, the company’s new financial report estimates a one-time tax benefit of more than $1 billion in 2017 from the new tax law, but the tax breaks it received by paying less than the official 35 percent tax rate in the previous decade total $14.6 billion. Conspicuously, Boeing’s December announcement did not propose hiring new workers, which should come as no surprise to Boeing employees. 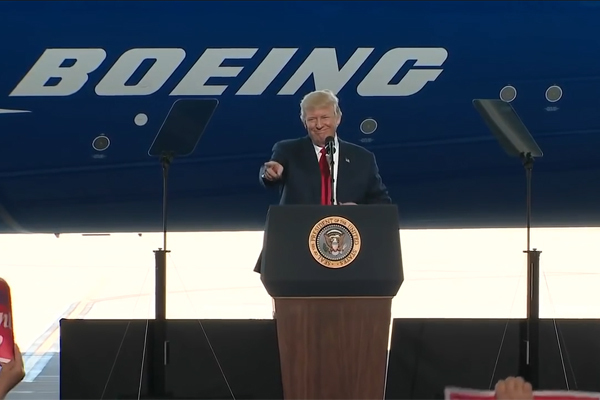 After all, the last Boeing plant visited by President Trump subsequently saw hundreds of layoffs. Boeing is a hugely profitable company that has billions of dollars in readily available cash. If a company as cash-rich as Boeing saw no reason to retain its workers as recently as last year, it’s hard to believe that a further reduction in a tax the company already avoids would change that calculus.